Singer… dancer… and impersonator doing impersonations! 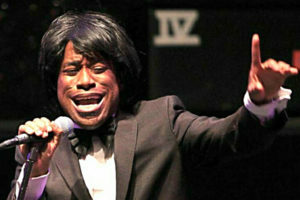 Our Sammy Davis impersonator will arrive at least a half hour prior to their start time. His performance can include either walk around interaction with your guests, songs, or some combination of the two… Just get ready to have fun! Wait till you see our Brad look-a-like. Thank you so much for bringing out the inner 12 year-olds from the 40+ crowd. You all definitely elevated our special day. To Infinity and Beyond!! !